Last summer, I started writing a series of posts with the highlights of my marathon trip all the way around France. A couple of months in, I decided that I wanted to describe the trip in more detail for my French site, and essentially abandoned this blog, leaving you all stranded at the fourth corner. Now I’m changing my approach once again. As much as I love writing about France, bilingual articles are simply too labor intensive. Between researching each place, writing about it in French, and then translating into English, those features required an inordinate amount of time. One of the reasons we moved to Menton was in the hopes that living in a beautiful, tranquil town would inspire me to work on a book that I’ve had in mind for years. Now that we’re settled, the inspiration is there, but the time isn’t, so I’ve decided to compromise. I’ll keep writing in-depth articles about France, but only in English. I’m going to continue from where I left off on the other site, and I’ll update the same map – you can see what I’ve done so far here: Six corners of the Hexagon. 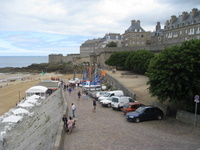 Our next stop was Saint Malo, just a little further west along the coast. We walked all over within and then on top of the walls of the fortified city, before sitting down on a stretch overlooking the vast beach for our picnic. Though we couldn’t see a guard station, every so often an admonishment about bikes on the beach would come over the loudspeaker. We kept half-expecting to be told to get off the wall, but it never happened. Other entertainment came from watching a photo shoot of a group of 5 men, who we figure must have been some rock group doing an album cover. 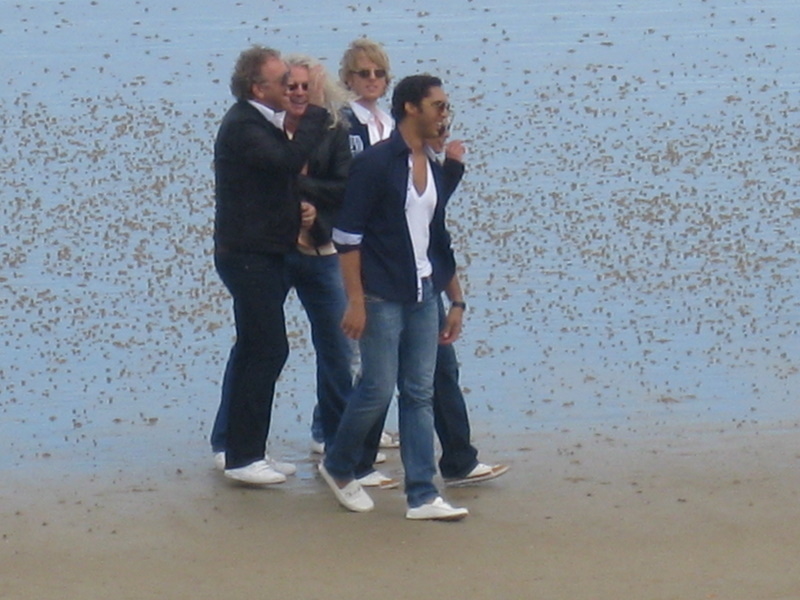 They started out walking along the beach in nice jackets, then changed into more casual clothes before doing a sort of rugby scrum for photo after photo. Thinking they might be famous, I took a few pics of my own, but I have no way to identify them. I tried Googling things like “rock group photo shoot in Saint Malo in August,” but no luck. One wore a jacket that said “Nickelson,” their van had Dutch plates, and we caught snatches of both American and British English. 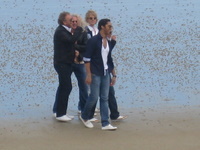 So here’s today’s challenge: anyone recognize these guys? You can click on the images to see larger ones. We spent the night across the river in Dinard, the furthest west into Bretagne I had ever previously been. From here on out, it’s all brand-new! Just read a great article about one thing that all Americans can do that really will make a difference: take it out of the big banks (you know, the ones that got bailed out and then gave bonuses to the very people who caused the subprime mortgage disaster and the need for bailouts) and instead put it in small, local banks. I am a firm believer in the power of the dollar – what we choose to buy and where we keep our money has over the course of our lives, in my opinion, a much greater impact than any other voting we might be allowed to do – so I did this years ago, and I’ve been glad every day since. So long 2008! Come on in, 2009! This was one of the best years of my life – I started out in Costa Rica and ended up – after trying to move here for almost 20 years – in France! May all your dreams come true, too. I’m very sorry to report that Kyle Roger passed away on 7 February 2009. My sincerest condolences to his family and friends. I went to an acupuncturist last year, and it was one of the weirdest experiences of my life. My lower back was spasming (due to a bizarre sort of injury I’d apparently sustained on a zip line) and I was in agony. (I was also in Maine visiting my mother-in-law, but I don’t think that had anything to do with it.) I decided to try acupuncture, but the “recommended” guy was unavailable, so I had to pick a name out of a phone book. This person practiced out of his home, which in theory I have no problem with. However, his kids were there too, and no one was there to take care of them. So he cracked my back (which was fantastic – I wish I could have that done every day) and then stuck me with a bunch of needles, hooked me up to this electrical impulse that pounded through my body, put a heat lamp over the whole shebang, and left me to “heal.” Nothing hurt, exactly, but it was so strange that I felt uncomfortable. (The crying baby a few rooms away didn’t help a lot either.) He came back 10 minutes later with his daughter, aged 7, who asked if she could take the needles out and actually started reaching toward one. This startled me, to say the least, and my subsequent jump probably undid the good (if any) that the treatment had done, because the next day my back spasms were worse than ever. This time, though, I ended up just loading up on painkillers and moving as little as possible. I know that this wasn’t a normal acupuncture session, but I’m still a little hesitant to try again. If my allergies don’t improve soon, I’ll reconsider.